Progress. | The Speckled Goat: Progress. Well! Now that we're homeowners, we're discovering the absolute joy that is remodeling our house. Besides a couple really quick pictures and the big announcement, I haven't said a whole lot about the house or our home projects, I realize. So, here's the skinny. 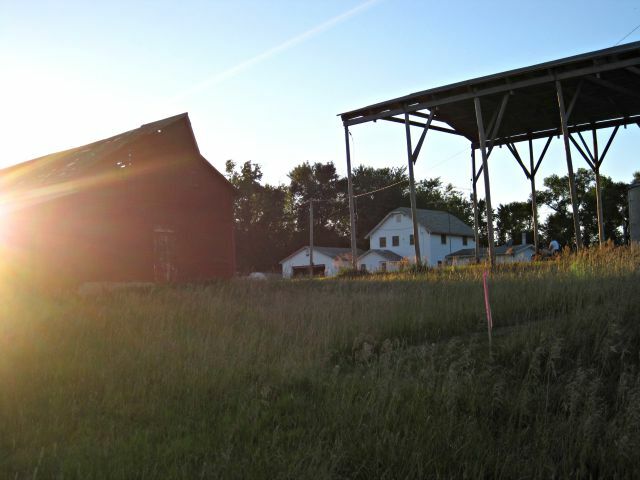 Back in June, we purchased a 1934 farmhouse in rural Iowa, and also around 20 acres of land (some pasture, some farmland, and a little pond), along with a barn, two machine sheds, and some other buildings. For the past few years, we've lived right at the Camp where we work, (the commute has been awesome), but we've really wanted to get our own place and have been looking for a while. 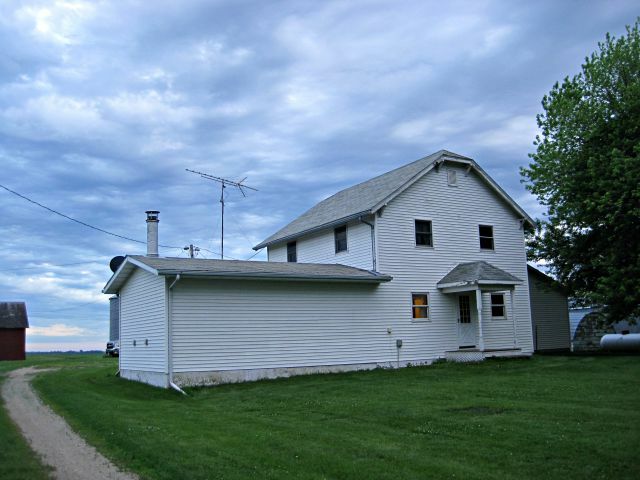 This lovely acreage came available, and all the pieces fell into place, and now it's ours. The house is in pretty darn good condition, but we decided to take advantage of the fact that we don't need to move in right away and do a few updates and remodel-y things to make it "ours." This room will eventually be our laundry room/mudroom. Mud and carpets don't mix, and after we discovered the original hardwood floors underneath, we started pulling up the carpet tiles. ... and here's what it looks like now, with the carpet mostly torn off and the floors mostly scraped. We still need to sand and refinish this floor. 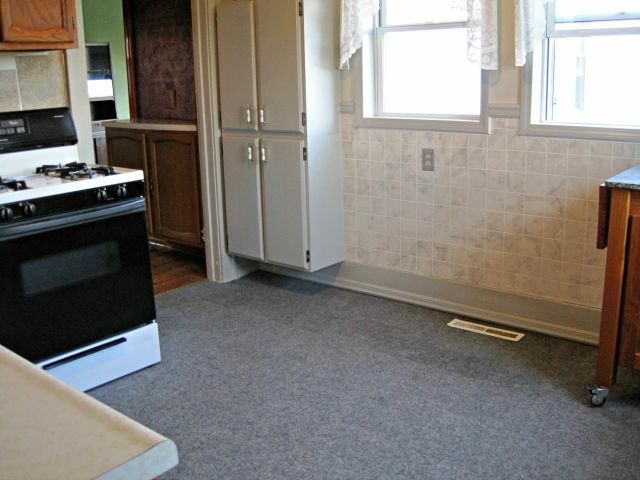 The same carpet tiles were also extended through the kitchen. 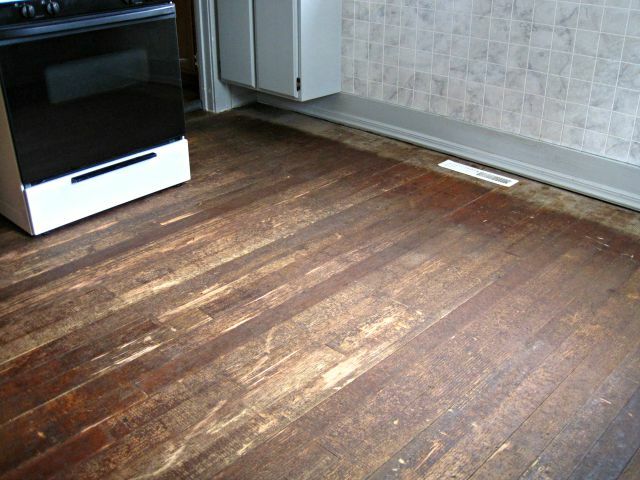 I just knew that the minute we move in, I'll drop an entire pot of spaghetti sauce on the floor and destroy the carpet, and I really love the idea of having those beautiful hardwood floors restored. So, more pulling up carpet. 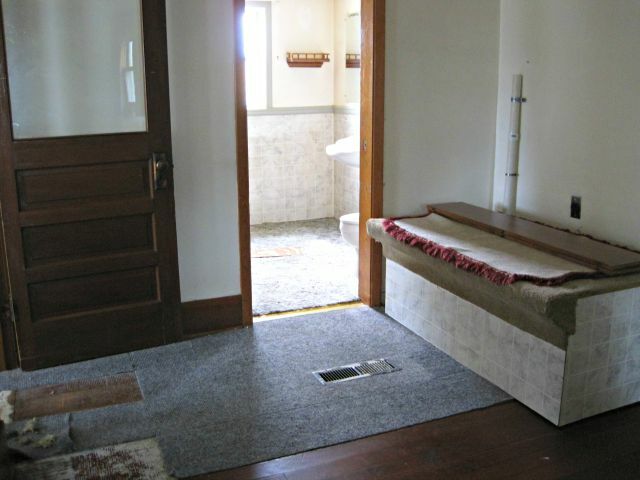 The bathroom was also carpeted.... so we tore that up, too. And we found adhesive tile underneath! 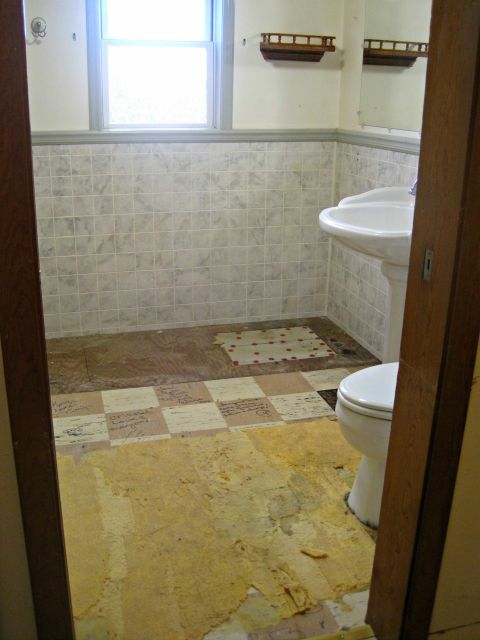 So I'm now working on scraping up those tiles (some are loose) before we put in a new underlayment and linoleum. 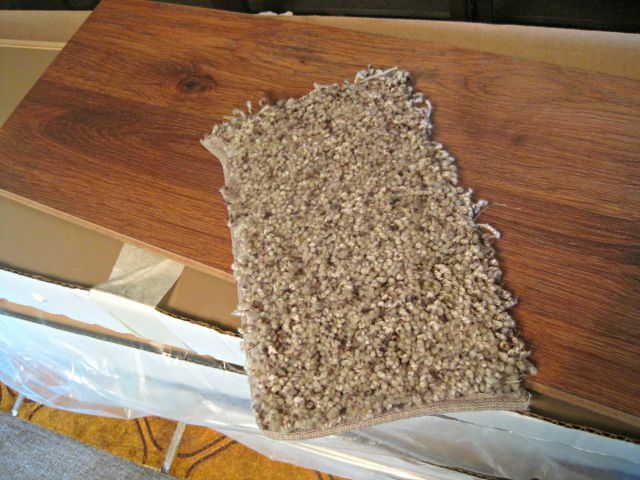 For the majority of the house, carpet is coming out and we're either restoring hardwood or adding vinyl linoleum stuff. Except in the living room- where we'll be taking out carpet and putting in new. And some wood, too. and a sneak peek at the new carpet and wood. One really fun thing about moving onto a farm is all the stuff that was left behind. We have so many buildings on our property, and most of them have some lingering "junk" in them-- and it's been really fun to go through the stuff and find little treasures (like deer antlers and old dishes). The next steps include finishing floors, painting, putting in carpet, roofing the house, putting in a new septic system, planning next year's garden, maybe doing some thinking about where to put chickens... there's some fun stuff ahead! 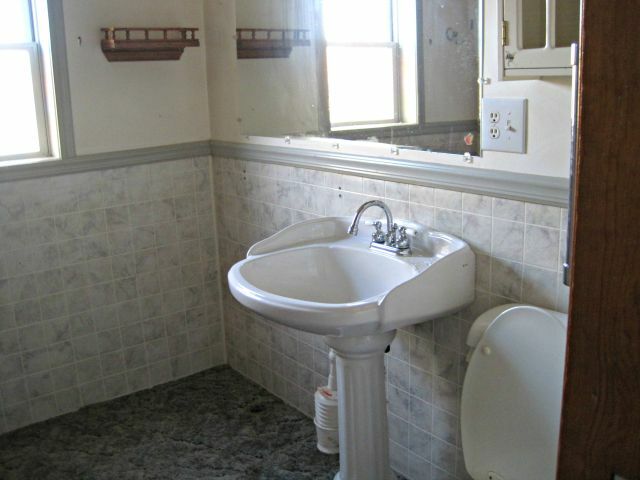 Have you done a home remodel? What was the most rewarding thing about it? What an amazing project! the original hardwoods are going to be so beautiful when they're finished. we ripped out linoleum and put in hardwoods in our first house- enormous pain but so gratifying! Those hardwood floors are definitely a labor of love- I got about two square feet scraped an hour. Such slow going! I keep reminding myself that it'll be worth it in the end, and the glory work is coming soon! I love the house and I'm sure you'll be adding so much charm to it. Those hardwood floors in the kitchen were amazing!! What a fun project! I'm sure it feels overwhelming at times, but I'm jealous of all the creative things you get to do! We've lived in houses that weren't our own since we got married- such a blessing, to be sure- but it IS really fun to get to pick paint colors and do some major renovations! Such a beautiful home. Do you know much of the history of it? 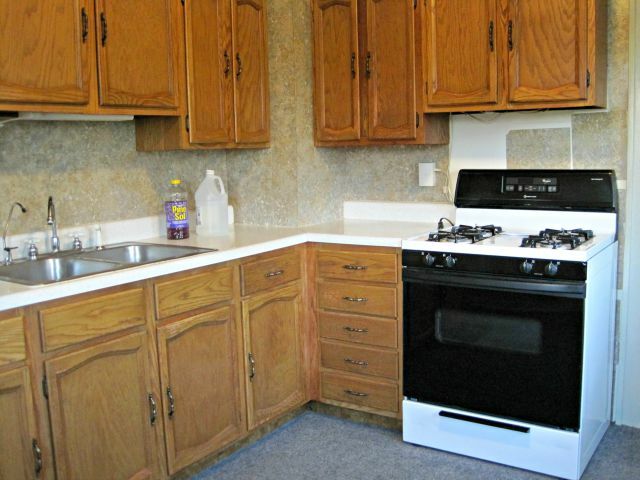 I am sure you will be discovering fun treasures all over the property for a long time. We have been privileged to know a little about the history of the house-- we're actually only the second family to ever (EVER) own this place. The original owners were the homesteaders of the property, and then they passed it on to their children. So cool. This looks like a gorgeous home! I love that you see the potential in it :) My husband and I just purchased our first remodel too and we are loving the freedom in being able to do whatever we want! Good luck.....it can get overwhelming! This is really cool! Stoked for you guys! Aside from the grass cutting, thats awesome having all that land!! We've been remodeling since February, and I think its really fun getting to do whatever you want with your house! (although there are definitely some parts that are NOT fun) If you guys go to remove any load bearing walls, I've become quite the expert (we've removed two) LOL. Just let me know! haha! Keep up the good work. This makes my architectural historian heart happy! Good work cousin! When would you like me to cover over to help? I picked up historical paint samples to take along! Contacted my WA. consultants to check out your blog for some great ideas to offer your way?! What an amazing find to have original hard word under all that carpet! yay! Your gift with words is jaw dropping my friend. It's a beautiful place and I can't wait to spend some more time there with a fire and the leave and quiet. Love getting in on the beginning of a huge reno project. What fun you will have. 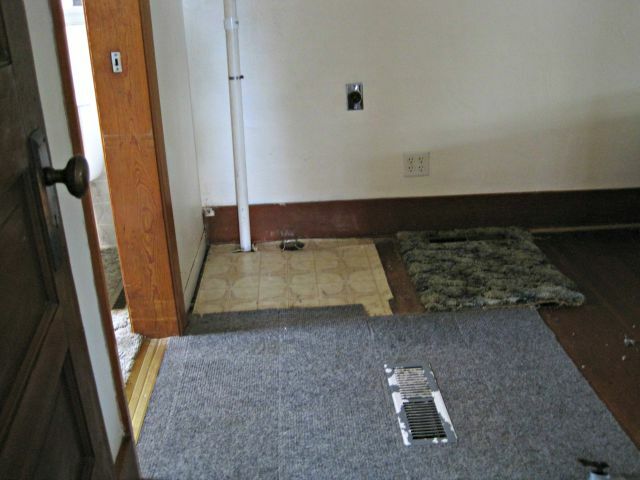 Now, the first suggestion - ditch carpet and put in wood floors (or tile or lino) throughout. Living in the country means dirt and mud on every pair of shoes you have! Have a blast, and looking forward to your blog. God bless! Yep, that's the plan! 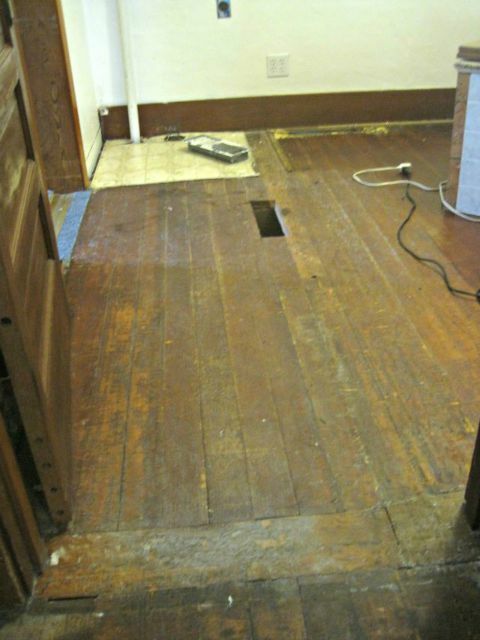 Most of the house has wood floors already, and we'll be restoring those. 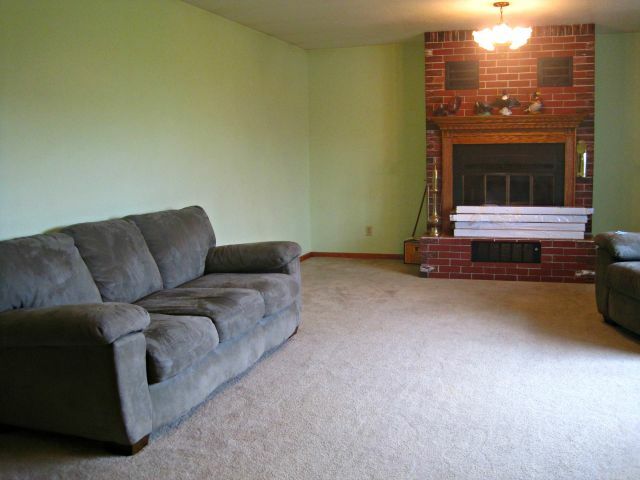 The only carpeted room on the first floor will be the living room.